FREE EYE TEST* with any set of frames and lenses. It’s important to get the right prescription for the health of your eyes. With over 30 years experience, our opticians are the best in the business. There is nothing we haven't seen before and we test for all common and unusual conditions and prescriptions. We can cover 90% of all problems with eyes and we have a wide network of contacts to refer to for the other 10%. Your eye check will be thorough, friendly and informative. We treat everyone with the care and attention you’d expect from an independent optician. And once you have your prescription, we don’t just leave you out in the cold. If you feel even slightly strange wearing your new prescription, its ok – even the best tests are never 100% accurate. Let us know and we’ll see you again for a tweak or two. It’s all part of the service. More in-depth eye exams than any of the highstreet brands. Easier to spot weaknesses and begin preventitive measures. 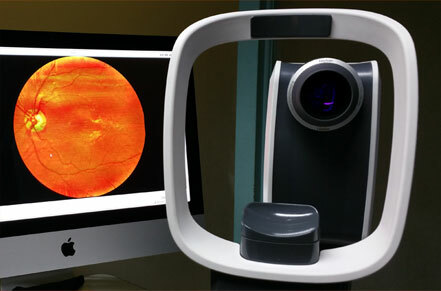 Ask about retinal scans when booking your next appointment.